Just a small part of the amazing grotto at the spa at the Omni Grove Park Inn in Asheville, North Carolina where we spent time just hanging out. My husband had given up drinking for January, so when we received two glasses of Champagne I kindly drank his as well. I’m nice that way. I’ve been lucky enough to have been massaged, plunged, scrubbed and oiled down in luxurious spas the world over. But my favorite remains one within driving distance of my home in Atlanta – the Omni Grove Park Inn in Asheville, North Carolina. 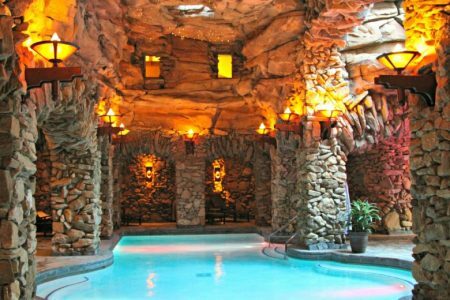 Here’s 5 reasons every travelgirl should spa at Grove Park Inn. 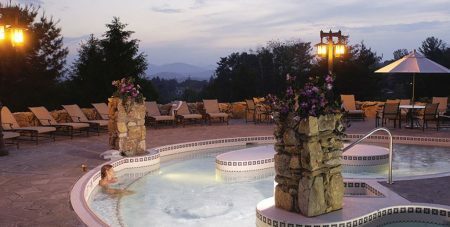 The Omni Grove Park Inn is one of my favorite resort hotels, for its location in quirky and fun Asheville, ambiance and historical significance. Built in 1913, this Arts and Crafts style property has hosted 10 presidents and many luminaries. F. Scott Fitzgerald lived here for two years while his poor wife Zelda was in a nearby insane asylum. I was entranced from the second I entered the indoor grottos with several pools, soft lighting and the best feature ever, huge waterfalls that cascade gallons of hot water a minute so you can position yourself underneath for a lovely back or neck massage. Simply heavenly. Our visit was in January with chilly temperatures, but once we took off our robes and sprinted to the heated water, we were so warm in the outdoor pool. And check out those killer views. 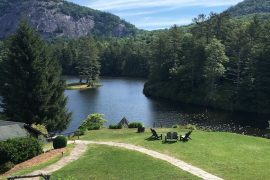 Yes, the temperature was hovering in the 20s outside, but we bravely cast aside our soft robes and dashed into the delightfully warm, steaming water of the outdoor pool with views of the huge U-shaped inn and the Blue Ridge Mountains. Sip a glass of champagne as the sun sets to heighten the experience. Every spa has its version of the quiet room, but what elevates this one is the beautiful fireplace, soft blankets and plenty of comfy chairs and magazines to truly indulge yourself. Worthy of mention on its own, the Omni Grove Park Inn has the best snack mix I’ve ever had in a spa, with nuts and magical little chocolate bits that I pick out first. I may have snuck a few extra out when I left, perfect for the ride home. 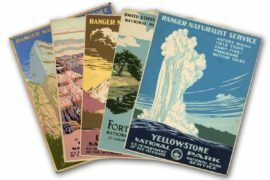 If you aren’t having a treatment, you may purchase a day pass, available for hotel guests every day and non-resort guests Monday to Thursday. Rates start at $75.